The EX90 Plus is built with multi grip poles, this offers numerous hand positions. This is especially comfortable in longer sessions and very effective of training the shoulder girdle, that through the different grip positions more varying movements are brought into your training. Additionally the EX90 course of movement is very comfortable - the major factor being the closely placed pedals and the excellent ball-bearings. The unfixed adjustable stride length makes the EX90 Plus unique – you are able to adjust the stride length between 45cm to 65cm. This feature lets you simulate different running styles and the EX90 Plus can be used by users of all sizes – that makes the EX90 Plus perfect for families or for semi-professional use in, for example, hotels or practices. A large stride length is an important factor while purchasing a crosstrainer. The EX90 Plus offers an especially large stride length in a compact package. This is made possible through the construction of the swinging pedals. The frame is made from steel tubing and is extremely stable. But the EX90 Plus can still be easily moved: the center of mass is cleverly laid and the crosstrainer is built with transport wheels. The EX90 Plus is designed so that easily do your training and is as comfortable as possible. This starts with the adjustable stride length. Quick adjustments to the stride length can be made with the hot keys and can be finely adjusted with the +/- buttons to suit your style. All settings can be quickly entered on the console: Choose a program with the hot keys or set a specific heart rate range for an optimal training session. It's your choice! 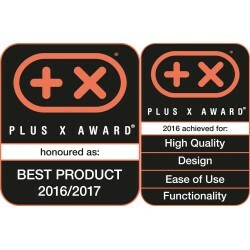 At the world's largest innovation awards for Technology, Sport and Lifestyle, the Plus X Award (04/2016), the Crosstrainer EX90 Plus won in four categories. 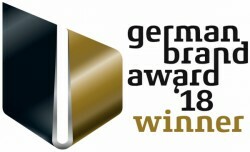 The EX90 Plus had the honour of receiving awards in the categories: High Quality, Design, User comfort anf functionality. The EX90 Plus was also awarded Best Product. 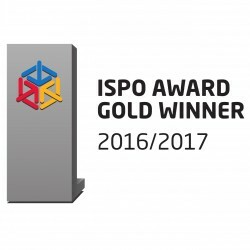 At the yearly gathering of the fitness industry, the ISPO in Munich, a specialist jury honoured the cardiostrong EX90 Plus with the Gold Award. Reasoning from the jury was: "A high quality, innovative home fitness elliptical trainer, that through its quality and concept is also suited for semi-professional use and topped off with silent mechanics. With its extreme space-saving construction it fits into every apartment. Its unique unfixed adjustable stride length makes it universally useable." 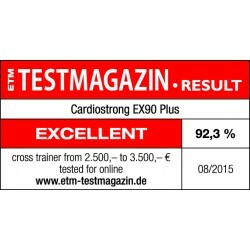 The cardiostrong Crosstrainer EX90 Plus in August 2015 was tested from ETM Magazine in the cateogry Crosstrainers from 2500 to 3500 Euro and was awarded "very good". Especially highlighted was its versatility: With its unfixed adjustable stride length the EX90 can be ideally adjusted to every body type. The detailed test reoprt can be found underneath on this page. The cardiostrong Crosstrainer EX90 PLUS delivers an exceptional training quality and variation due to its unfixed stride length adjustability. The stride length can be adjusted between 45cm to 65cm. In order to make a quick change between the lengths, there are 5 pre-determined lengths available, in which further adjustments are possible for your personal stride length. What advantages offer crosstrainers with adjustable stride lengths? One advantage that an adjustable stride length on crosstrainers and elliptical trainers offer is that it can simulate different running styles. With a short stride length it simulates more a stepper movement, at the longest length it can feel like a sprint. Different muscles groups are also activated depending on which movement you choose. Through these changes of stride length you can vary your training more often, more comprehensive and also more effective. An adjustable stride length crosstrainer is also perfect for being used by more people with different body types. For example in a multiple persons household (Family or shared household). Also for semi-professional facilities numerous users can train on the cardiostrong Crosstrainer EX90 PLUS. For a comfortable training it is essential that the stride length is adjustable. 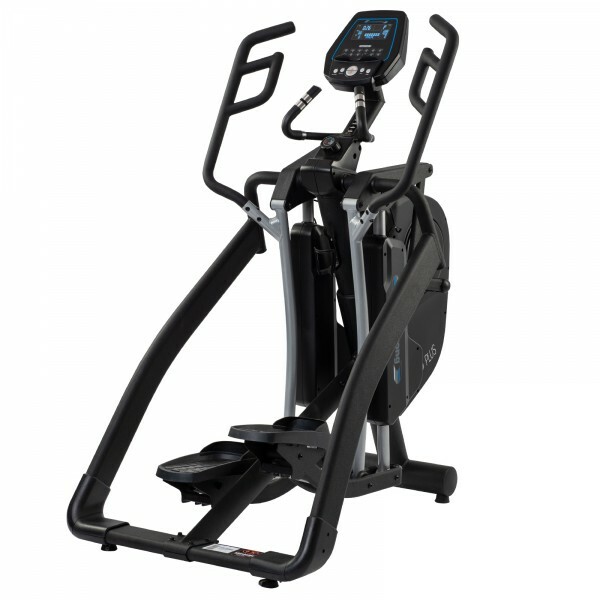 The cardiostrong Crosstrainer EX90 PLUS is built with a massive metal frame. Not only does it look good but gives the crosstrainer high stability. Good for two important reasons: The life longevity is significantly increased, even with repetative intensive workouts, and an optimal power transfer is ensured. Even with its heavy weight the cardiostrong Crosstrainer EX90 Plus can be easily moved. Through an optimally designed center of mass, the crosstrainer can be easily lifted at the end and tipped fowards onto the transport wheels for easy transportation. Due to the high quality production and excellent stability the cardiostrong Crosstrainer EX90 PLUS is suited for semi-professional use. Not only is the length of the movement on the cardiostrong Crosstrainer EX90 Plus excellent but also the width of the movement! Both pedals are placed very close to each other and produce an even more comfortable movement. Movement for the upper body is also taken care of. The multi grips make it possible to train with different grip positions. 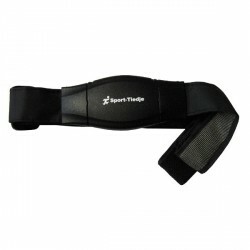 It is not only for the comfort of different body types of the users but in longer training sessions many users find it comfortable to change the grip positions during their training. Polar H1 chest strap/heart rate sensor In stock! cardiostrong elliptical cross trainer EX90 Plus add to comparison list.